Sometimes we all need a break from our favorite foods. For us, it's rice. We love rice and could easily eat it everyday as part of every meal. So to switch things up a bit, I incorporated other starches into our meals. Pasta was one of those things my husband doesn't care for too often because it can be a bit too heavy. That's when I discovered orzo! I like serving this as a rice substitute and it's similar to rice, you can combine it with other ingredients to take on new flavors. 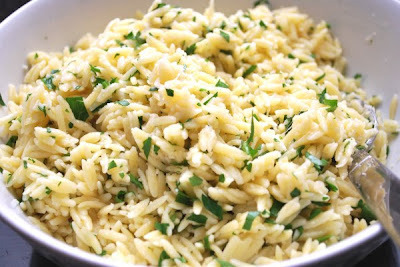 For a side dish to an Italian inspired dinner, I prepared orzo with freshly grated Parmesan cheese and fresh chopped parsley. It's not only easy, but good and light for a starch. Add 3 cups of water, orzo pasta, garlic and butter. Season with salt and pepper to your tastes and stir in Parmesan cheese and parsley. Could you substitute rice for orzo?